Hours of operation are 7:30am to 3:00pm. 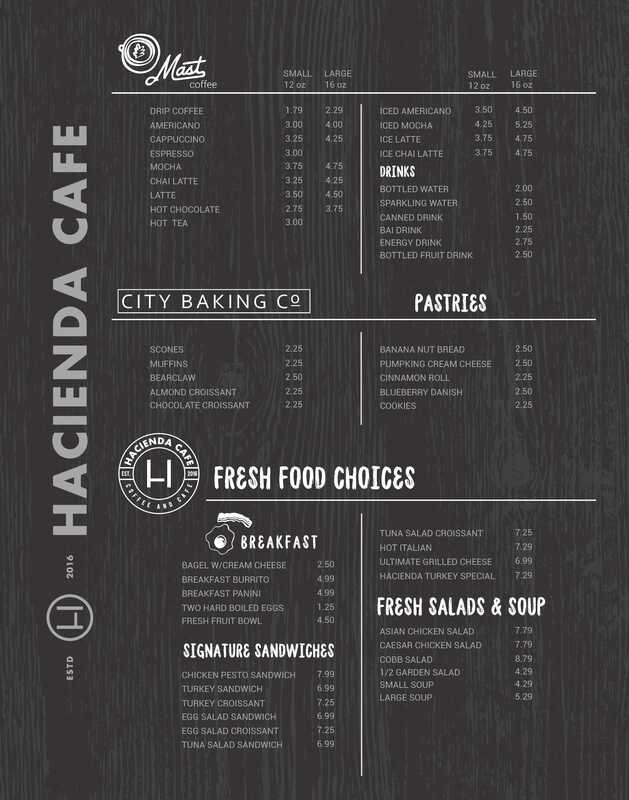 The Hacienda West Coffee Cart is located in the 3825 Hopyard Road lobby. Click on the menu below for details. Lunch pre-order and pick up is now available! 2. Select "Order Online" tab. 3. Make sure "Pick Up" is selected in top right corner. 4. Select your preferred lunch entree items and be sure to type "KIOSK" under special instructions. 5. Finish order by clicking "Pay In Store". 6. Pick up your food by name after 11am. -Cut off time for pre-order is 10am. -Orders must be for the same day pickup. No future date orders can be placed at this time. -If you forgot to type "KIOSK" under special instructions, your order will be available at the main cafe located at 4305 Hacienda Drive. -Specialty drinks/coffees will need to be ordered separately until the new online ordering system is up and running.